Even before I started blogging, Linnie in California sent us her wonderful soaps and body products “just because.” All of us at Bramble Berry adore Linnie and are always thankful for her beautiful soapy presents. Click here to see the last box of goodies she sent.However, her latest package caused a little rumble at the office. We had a huge debate on which scent was our favorite. Adrienne loved the (custom blended by Linnie creation) Zen Garden, Amber’s favorite was theMango and Rhubarb Sorbet and Courtney loved the Mimosa (Champagne and Peach). My favorite was the Apple Rhubarb Tart! YUM! All of these soaps contain skin loving ingredients like Shea, Mango and Coco Butter. My skin can hardly wait. Linnie also sent as some great smelling moisturizing creams as well. 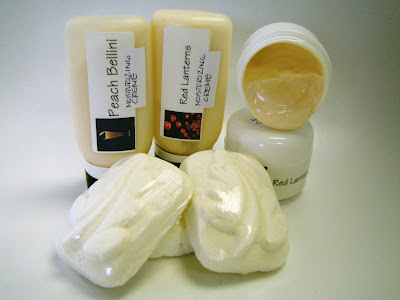 There was no argument on the best cream scent; we all agreed on the Peach Bellini– very fresh smelling.And to totally spoil us rotten, over the top, she sent us couple of her Sweet Dreams Bath Melts (an oil rich bath fizzy). I can’t wait to try all of our new goodies! A Sweet Dream Bath Melt is an excellent excuse to take a relaxing bath today. Thanks Linnie! You really shouldn’t have, but we’re so glad you did! Well, I don’t know her in person, but have been e mailing so many years I feel I know her personally, does that count, LOL? The internet is great for meeting new friends. You’ve met Linnie? Gosh, you are lucky. She’s been sending us little care packages for at least four years and I’ve always been so thankful. I’ve never seen where she sells her stuff online though – I’d love to give her site a pointer if she had one? 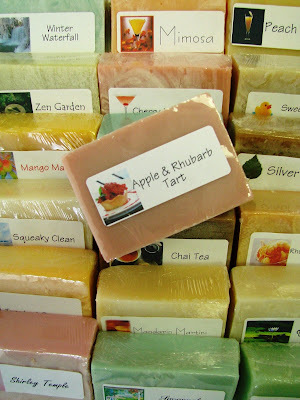 We love the soap – her blends are delish and creative. I know Linnie, she is a real peach and so generous with her wonderful creations. You are very lucky people! At least you all weren’t arguing over the same bar of soap! There were enough to share! The bath melts sound divine!